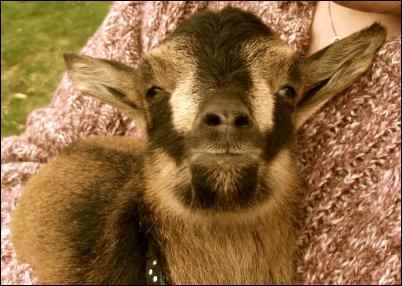 Raising a housegoat is not for the faint of heart, nor is it normal. Truth is often stranger than fiction, and normal is not something that we’ve ever aspired to, my husband and I. This is the true story of how a little homestead began, all because of a little surprise goat. I had accepted a position—a temporary position, mind you—as a farmhand in the farm department at a local living history museum. I’d already been working at the museum for several years when I received a call, out of the blue, that January from the farm manager, John, who had just lost his only help to the Marines. Years before, I’d done similar work, so rather than spend the winter collecting unemployment, I jumped at the chance to do something more my style. Little did I know then that the call I took sitting at my dining room table was about to completely change my life. By the end of March, lambing season was in full swing. We had ten bottle lambs, and our very small department (all two of us) had its hands full keeping the lambs fed and occupied, on top of getting ready for another season open to the public. We had things pretty well under control (or so we thought) when one of our goats decided to give us an April Fool’s Day present. 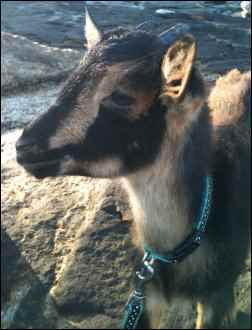 Tulip was our best breeding doe in the San Clemente Island Goat division of our rare breeds program. Actually, she was our only breeding doe of that variety. She’d given us two sets of twins within the last year. Every morning, I would arrive in the barn to feed the four goats that lived in a stall together, and every morning, without fail, Tulip would stand up and smile broadly at me through the bars; I wondered what made her smile so. Sometime in the dead of night on March 31, coy Miss Tulip delivered a single doeling. She had just kidded on September 17, so neither John nor myself had detected any sign of her new pregnancy, nor did we suspect it. A volunteer at the museum stopped to visit the goats that morning and noticed the tiny kid, no bigger than a guinea pig, lying almost lifeless in a corner. Said volunteer called John immediately, who went and retrieved her, fearing the worst. She had poor circulation; her tongue was an unusual shade of plum. The tendons in her rear legs hadn’t connected well to her tiny hooves. He gave her less than a 50-50 chance of surviving. John, who was overwhelmed with lambs bouncing around the barn when I stopped by the next morning, was more than a little frustrated with the tiny goat, now named Sandy, who was staunchly refusing to take a bottle. 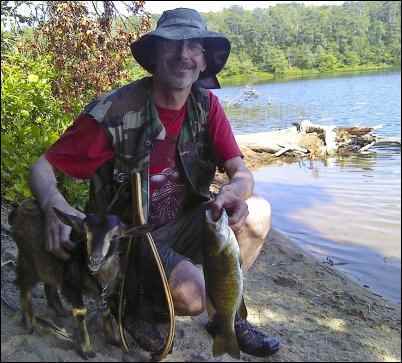 I could tell he didn’t have time to deal with a “special-needs goat,” especially one that his dog didn’t like. I offered to take care of her for a few days, an offer he readily accepted once he realized that I had, during our conversation, coaxed her into latching on to the tiny soda bottle and sucking down milk replacer for all she was worth. At the end of the day, I went to collect my new charge. He handed me a small pet carrier so light that I had to turn it and look in to make sure that Sandy was actually inside, a bag of milk replacer, and a bottle. “Good luck and thank you,” was all he said. I tucked her pet carrier into the back seat of my VW, picked up my now-husband, Chris, and drove the thirty miles to our home outside of Boston. At the time, we were the resident caretakers of an antique farmhouse owned by the town historical society. It had been at least half a century since livestock had lived anywhere near that house, as the town had changed during the twentieth century, shifting from a little agricultural and industrial town to a bedroom community for the nearby metropolis. You could see the subway station from our kitchen window. Town Hall was across the street. But I figured that keeping a goat inside for a day or two while she got stabilized wouldn’t create any problems, and so we began Sandy’s first few days of intensive care. Thankfully, Chris had raised goats before and was entirely enthusiastic and helpful with the project. He very quickly fell in love with the tiny, haphazardly-assembled, adoring little animal that we were to baby-sit. Because Sandy had to be bottle-fed at least three times daily, she had to go back and forth to work with us. I’d transported livestock before, but never had I encountered such a good passenger. She was silent as we drove, causing me to worry that she’d died in transit, but no! There she was, watching the world go by out the car window. We’d arrive at work and she’d happily trot clumsily at my heels. Chris quickly became Papa and I became Mama, and Sandy quickly became attached. So did we. A week went by and I called John to ask him when he wanted Sandy back. He was noncommittal. I stopped up at the barn after work one day and he watched the tiny goat follow me everywhere I went with his characteristic wry smile. “Nope! She’s yours! I don’t need her back,” said he. At first I thought John was joking. I tried to argue that I lived in a small city, with a sizable yard but no fencing and no zoning regulations permitting a goat. I had no experience in raising livestock at home. John’s declaration left us with a conundrum. Our housemate, Melissa, was equally enchanted by this deer-like sprite. I’d been bandying about the idea of starting an urban agriculture program at the historical society for some time, and it seemed like this was the moment to make those plans a little more concrete. Melissa and I approached the president of the society, suggesting we could keep Sandy and a couple of sheep with minimal fuss and maximum public appeal. For a well-heeled Boston Brahmin who probably hadn’t kept so much as a guppy since his youth, he was remarkably receptive. He advised calling the town and finding out what it would take to make it work. By the time I had appealed to the Board of Health, Sandy was more than a month old. She was still commuting to the museum every day, “helping” with chores and office work, delighting visitors. She was also still terrified of goats. Our 1,200-pound ox was her friend, but the mere sight of a goat sent her running. Sandy’s day in court was fast approaching; I wrote up a proposal for our new urban agriculture program, designed a pen, dreamed up a manure removal program, and began wondering which trustees I could hit up for donations to make it all happen. On the evening of her hearing with the Board of Health, suits were the attire of the occasion. Sandy got her big-girl polka-dot collar and matching leash. We summoned our friend Russ, volunteer extraordinaire at the historical society, to stand with us as an additional character witness on Sandy’s behalf. And promptly at 6:45 p.m., Chris, Russ, Melissa, and I marched tiny Sandy across the street to Town Hall and up to the second floor. Three members of the Board were present. Sandy got scooped up and put on their table, where she politely nibbled their ties and their paperwork. Three members of the Board promptly melted. Fundraising for the project began quickly and faltered nearly as fast. One trustee gave $5,000 for the fence and a shelter. Decisions could not be made without committee about the type of fence to be installed. A second trustee was convinced there would be flies. And who would pay for the feed for a goat and two sheep? Chris and I booked a vacation for the middle of June just to get away from the nonsense of trying to establish the program. I asked John to babysit Sandy while we went camping. “Absolutely not. Take her with you!” came his reply. With that decided, we set about planning our trip. Thankfully, the campground on Cape Cod we selected was pet-friendly. So pet-friendly, in fact, that the reservation form asked, “Are you bringing pets? Y/N. If yes: Dog, cat, other.” We cheerfully circled “other.” Sandy moved into a big-girl pet carrier, one meant for Saint Bernards and the like, and we worked on weaning her before the trip. She was still fully convinced that water was made out of poison and that grain was unsuitable for caprine consumption. Chris went so far as to try the human-baby-weaning trick of pretending to eat the grain while smiling and saying, “Numnumnumnumnum!” To this day, goat grain in our house is known as “nummies.” Sandy remained largely unconvinced of its virtue. We made our preparations for the trip, packed up the SUV, and promptly found we had a dead battery on the morning we were set to leave. AAA patched us up and we were on our way. Before our journey began, I had indulged myself in a new book. Its title intrigued me: The Backyard Homestead. I admired New England farmers for their success, by the 19th century, in producing much of what they needed (at least in terms of meat, dairy, grain, fruit, and garden produce) on their own property. I had acquired the book mostly with the intention of figuring out how to create a productive kitchen garden in our backyard to supply our foodways programs at the historical society. I had no idea that the book was about to set us on a crash course with homesteading for ourselves. Sandy loved camping. Our campground neighbors thought she was the most darling creature ever (which, of course, she is). We went hiking. We went fishing with Papa, though Sandy could not figure out why Papa would return the fish to the “poison” after he had obviously rescued it. We went antiquing. We visited Provincetown (where it is apparently possible to actually attract attention from the locals by walking a goat around on a leash), and went shopping and investigated the harbor. We almost took her to the top of the monument, but by that time, all of us were tired and didn’t want to climb stairs. And I read The Backyard Homestead. I informed Chris that we were going to buy a house and become at least partially self-sufficient. He looked at me, took a deep breath, and agreed. When we got back from the Cape, I launched into our new project with more gusto than I’ve ever tackled anything before. To hell with the historical society! I was burnt out after two years of working seven days a week between my two jobs, only one of which was still fulfilling. I was inspired, and I would be damned if I weren’t going to succeed in finding us a place to put down roots. Of course, two museum professionals rate somewhere between “destitute” and “working poor” on the socioeconomic scale, and while we didn’t need much, a mortgage was going to be hard to obtain. All we wanted was a house on a piece of land suitable for tilling and penning up goats. The process ended up being a bit like Frodo’s journey to Mordor in The Lord of the Rings, and those in our fellowship were treading a long and treacherous road. Robin was our unfailing companion throughout the Saga of Buying the Bungalow. She found us a number of properties that fit the bill in terms of land, but the houses weren’t quite what we had in mind. We finally set up a date to see two places, one in West Wareham with an acre and a quarter on a pond and one with five acres in Middleborough. Sandy, of course, was still commuting with us, and therefore had to come along to the house showings. We left work one August afternoon and trundled our way through cranberry bogs and pine forests until we came to our destination: A small 1928 bungalow, nestled in a heavily wooded lot with pond frontage, with only one neighbor. We let Sandy out of the car and walked around. It had a great big back yard, shady and treed. It had a shed. Robin met us and showed us around inside; it had an interior not updated since the 1960s (perfect for a pair of vintage nuts like us). Chris was effusive; I was in love, but reserved. Sandy nummed the hostas, which we took as a sign of her approval. This was the place. We looked at the other house, which was not the place. We began our quest in earnest. The months that followed were agonizing. No conventional mortgage lender would approve us. Sandy continued to live in the dining room and commute to work with us, even though she had long since been weaned; we wondered what kind of people we were to have kept her without being established on a farm. We took Sandy along to visit Chris’ parents in Maine, where we were hoping to get away from the stress. We took her to Fort William Henry. We took her to walk the rocks at Pemaquid, where she nummed the barnacles and seaweed and decided that she didn’t like seafood. We discussed renting if we couldn’t get a mortgage; then we considered what kind of landlord would take a couple with lots of pets (including a housegoat). We were just as discouraged by the time we got home as we had been when we left. When we got back, Robin had an inspiration strike her at 2:00 in the morning. She was kind enough to wait until 6:15 to call me with her idea: The USDA’s Rural Development program! Ultimately, the paperwork and hoop-jumping were worth it. The USDA came through for us, as we met both income and property location criteria. The house would be ours! The homesteading could begin! 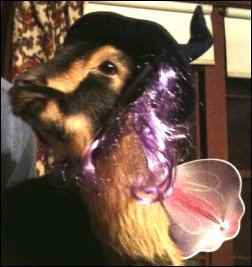 Sandy dressed up as a fairy princess for Halloween to celebrate. Then there were tie-ups, hang-ups, and hysterical fits of hysteria. By the end of November, I was so tired and worried about the whole situation that I thought I’d tied myself permanently into a pretzel. Tie-ups and hang-ups continued. Sandy continued to live in the dining room. To cheer ourselves up, Chris and I decided to do something characteristically unconventional. The local Very Posh and Ritzy Mall had a pet night at their “Photos with Santa” stand. None of the advertising said anything about “pets” being restricted to dogs and cats. So, to get out of the gloom and doom of poverty and the uncertainty about our house, we bundled Sandy (and her new poinsettia-festooned holiday collar) into the VW and trudged off to the mall. Never have I seen so many delighted folks in my life as we paraded our little goat past the high-end retailers that we could never afford even if we wanted to (which we didn’t). Sandy was so proud of herself that she practically glowed. Even the normally disgruntled “elves” at the photo booth were enchanted. Santa was a good sport and posed dutifully with Sandy for her picture. Our friends and relatives still hold that snapshot as being the essence of our insanity. Shortly thereafter, we got word that we would be closing on the house on December 30. We went to New Bedford, signed more paperwork than we ever imagined possible, and promptly invited our friends over for a bring-your-own-chair pizza-party in our empty bungalow. We slept on an air mattress in the house that night, with visions of hand-picked salads and goat cheese and fresh eggs dancing in our heads. Sandy’s life has gotten a little more ordinary since we bought our house, with periodic bouts of excitement. 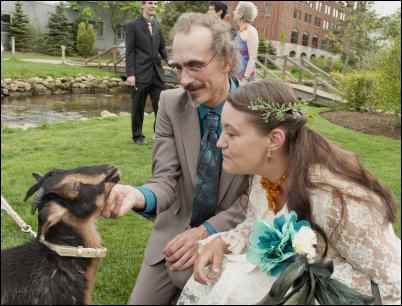 She was the flower goat in our wedding and came along on our honeymoon—again, to Cape Cod, where the whole dream really coalesced. The owners of the pet-friendly bed and breakfast we chose were so enamored of the idea that a honeymooning couple would take their beloved pet goat along that they waived the pet fee, upgraded us to a suite, and insisted on taking Sandy’s picture by the pool. (They subsequently mentioned the visit in a review in the Boston Globe). Sandy eventually made friends with another surprise goat who came to live with us later on and was actually sad when we sold him. Sandy has gotten used to living with her baby sister, who came home to us after Maggie had an unplanned date with a buck of a different breed. In April, Maggie—who is almost as small as her sister, and they’re both well below breed standard—gave us twins, and Sandy is begrudgingly accepting her niece and nephew as members of the goat herd, of which she is clearly not a part. The Bungalow, never meant to be a farmhouse, has become one nonetheless. We milked little Maggie for a month and had the best goat’s milk we’d ever tasted. The sneaky chickens (cheeky sneakens?) roam free and hide their eggs. The garden has been installed and besieged by baby bunnies. We butchered our first meat chickens last weekend. As much as I was tempted to call our place “Oops Farm,” considering all the surprises and accidents that inhabit the place, we decided on Withywindle Farm as a name, as we’re both Tolkien aficionados and our journey to becoming backyard farmers was a quest worthy of the Fellowship. I still have that “temporary” job at the museum. Our dreams continue to grow and come true, our quest is ongoing, and we have one tiny little goat and one generous farm manager to thank for giving us the kick-start that we needed.